Why Does the Museum Need to be Strengthened? What Does the Stabilization Project Involve? Why Does the Museum Need a New Heating and Cooling System? In 2007, California State Parks began a two-year project to strengthen and insulate the Antelope Valley Indian Museum. Work is expected to continue through 2010. Installing a cost-effective heating and cooling system that will maintain a stable temperature and relative humidity – vital for the preservation of the building and the artifacts cared for by the museum. Artist Howard Arden Edwards designed the museum in the 1920s without a trained architect – and long before modern building codes were enacted. Edwards salvaged sheets of plywood from theatrical sets and used them in the museum’s construction. The museum sways and creaks as every gust of wind takes its toll on the 80-year-old wood frame, and rain seeps in where the museum’s many decorative roofs join together. For structural engineers and architects to study the building, the collections needed to be removed from the exhibit cases. More than 3,000 objects were removed, catalogued, and carefully stored in summer 2007. After the collections were removed, structural engineers and architects began studying the building to get a complete picture of the loads that the roof and walls currently support. Bring the building up to at least the historic building code. The Antelope Valley is a place of climate extremes. The temperature can rise to over 110° Fahrenheit in the summer and drop below freezing in the winter or at night. For many years, the museum was cooled – to a point – with swamp coolers. Although the desert air is very dry, mechanical cooling systems such as swamp coolers create humid tropical conditions inside buildings. Temperature and humidity extremes are uncomfortable for museum visitors, but they are dangerous for objects in the museum collection. Many of the objects in the museum collection are made from plant and animal parts. They swell and shrink as the humidity goes up and down. Eventually they crack and break apart. Hot and humid conditions, such as when the swamp cooler is on in the summer, can also cause mold to grow and damage objects. The temperature and humidity underground is stable year-round. The geothermal heating and cooling system (a green technology) takes advantage of this fact. It will move heat energy to and from the earth to heat and cool the museum without creating drastic changes in the museums' humidity. 1880s Yurok basket. Crack will be repaired by a professional conservator as part of the stabilization project. 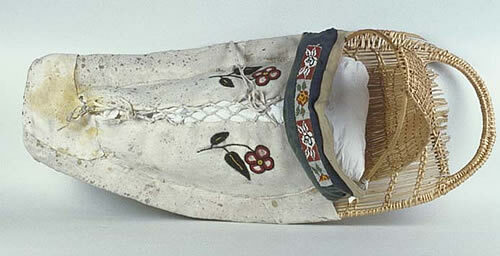 Northern Paiute cradleboard. Mold damage will be repaired by a professional conservator as part of the stabilization project. Many of us have packed and moved our household possessions, but how many of us have packed an entire museum collection? In June 2007, a professional art conservator, four State Parks curators, two State Parks exhibit designers, a State Parks maintenance aide and a Park aide had the opportunity and challenge of doing just that at the Antelope Valley Indian Museum. An important part of the long-awaited museum stabilization project is to protect the museum collection during construction. The engineers and construction contractors plan to strengthen the museum’s walls and roof. They will need access to all the walls and ceilings inside the museum. State Parks staff wanted to allow the engineers and contractors as much freedom of movement inside the museum as possible without them or museum staff having to worry about accidents to fragile museum objects. Therefore, State Parks decided to remove the entire collection with the exception of paintings and furniture that are part of the walls and a few of the largest, most unwieldy groundstone metates. Because so much of the collection was moved to safe storage, it will be easier to protect the objects that were not removed. On June 11, curators Edra Moore, Christina Swiden, Katie Metraux, and Peggy Ronning began wrapping museum objects in acid-free tissue and foam and placing them in boxes. Rugs were rolled onto tubes to avoid any folds or creases that could damage them. The catalogue numbers were carefully noted as objects were placed in boxes. Later the storage locations of all the objects were recorded in the computer catalogue, so the museum curator will be able to find objects for researchers while they are in storage. State Parks exhibit designers Don Amos and Bill Bell disassembled the Great Basin and Antelope Valley Room exhibits installed by State Parks in the early 1990s. They also analyzed the existing mounts used to support the objects on exhibit. They will develop and fabricate improved mounts for the museum’s reopening. 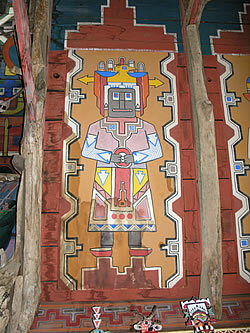 One of the most daunting tasks was to take down all the painted Kachina panels on the ceiling of Kachina Hall. State Parks staff wanted to ensure that these panels were protected from potential water damage while the roof is being stabilized. Conservator Alejandro “Alex” Reyes-Vizzuett developed a special system to support the panels as they were lowered to the floor. Park aides Kendra Betts and Patty Skinner were his agile assistants on the scaffolding. Alex will clean and stabilize the panels while the museum is closed. On June 29th, a team of professional movers arrived to move the groundstone artifacts, boxes, and furniture to their temporary storage locations. All of the objects made or organic materials, such as baskets, rugs, and shells, were placed in climate controlled storage containers. 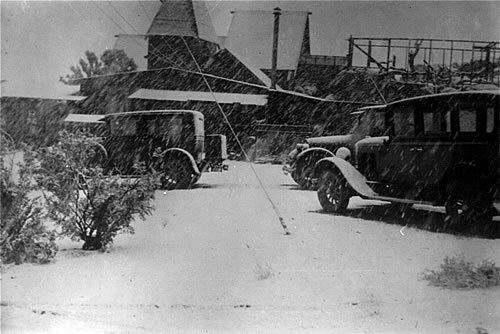 In 1928, Howard Arden Edwards constructed a 40- by 60-foot frame structure on a rock outcrop at Piute Butte for $3,200 (Edwards 1932). 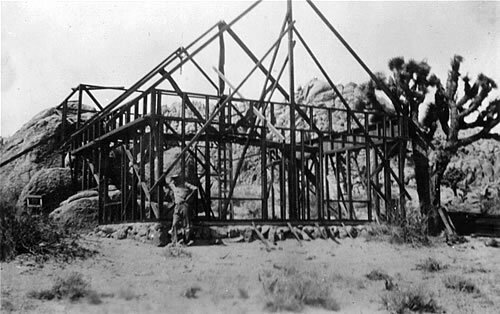 This structure was the beginning of the Antelope Valley Indian Museum. Beginning in 2007 and finishing in 2009, at a cost of more than $2 million, California State Parks will stabilize this structure, now on the National Register of Historic Places, to preserve it, and the collection it houses, for the enjoyment of future Californians. The Homestead Act required applicants to build a home on their claim. Many applicants built the smallest, simplest structure possible to meet the requirements. Howard Arden Edwards had a larger vision, but not necessarily more resources. Edwards and his son, Arden, did most of the construction themselves with the assistance of some of Edwards’ Lincoln High School students, itinerant workers, and a few specialists, such as the paving contractor who poured the concrete floor (Bevil and Ahlstrom 2000). People undertaking the construction of a building today – with all our modern regulations, permits, and inspections – look back at the early twentieth century with some nostalgia. However, as we have seen, a lack of architects, engineers, and durable building materials at the beginning results in their expensive application later on, if one wants to the building to stand for another 80 years and more. Of course, not only the Antelope Valley Indian Museum building is valuable. The collection it contains has uncalculated value of its own. An additional challenge of the project is to stabilize the building without affecting the collection. State Parks received $500,000 in deferred maintenance money to move the collection out of the building into climate-controlled storage containers. The collection was removed and placed in storage in June 2007. 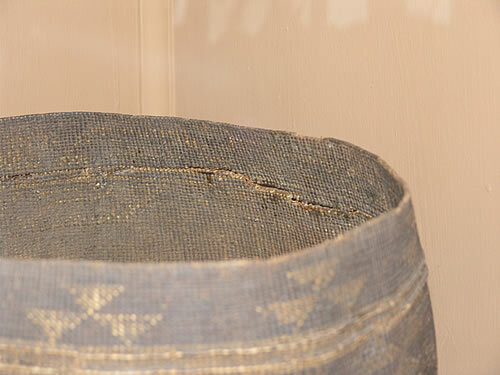 During the packing process, some artifacts were selected for conservation treatment, based on their value and level of deterioration. These objects will be conserved while the building stabilization is underway, and they will be returned for the museum’s reopening. We are fortunate that the budget for the stabilization project will also include development of a climate control system for the museum. So what sort of climate control system will be economical in a climate where the temperatures rise to over 100 degrees Fahrenheit in the summer and drop below freezing in the winter? State Parks is going to try a geothermal exchange climate control system. This technology involves drilling deep geothermal wells in order to take advantage of the stable temperature and humidity to be found deep underground. Water will be pumped into the well so it can stabilize at the temperature and humidity at the bottom of the well. Then it will be pumped into heat exchangers that will heat or cool air that will be blown into the museum. This system only uses electricity to run the pump and fans. No energy will be needed to heat or refrigerate the air, so it is less expensive to operate than traditional heating and air conditioning systems. It has the additional benefit of providing a stable humidity too. Following completion of the engineering design work and drilling of the geothermal wells, the physical work to stabilize the building is expected to begin in autumn, 2008. State Parks anticipates that the construction will take until the end of March 2009 to complete. After the construction work is done, the conservators and curators will return to unpack the collection and put the exhibits back in the museum. This should take about three months. If everything proceeds according to plan, the museum should reopen in September, 2010. 2000 “Rancho of the Sun” Antelope Valley Indian Museum California State Parks Facility No. 579-A-4-06-0-001 Historic Structure Report. Sacramento, California: Department of Parks and Recreation. 1932 Homestead Entry Final Proof, Testimony of Claimant. Document on file at Antelope Valley Indian Museum.